Our estate includes 13 acres of vineyards that yield a small crop of concentrated and intensely flavored fruit. We grow mostly Cabernet Sauvignon with small parcels dedicated to other Bordeaux varieties, Petit Verdot and Cabernet Franc. Our Napa Valley estate contains three variations of Bale Loam soil derived from alluvial fans from the surrounding mountain ranges and the Napa River that borders the estate. We have several different clones of Cabernet Sauvignon planted here: See, 337, 191, 29, 4 and 6. 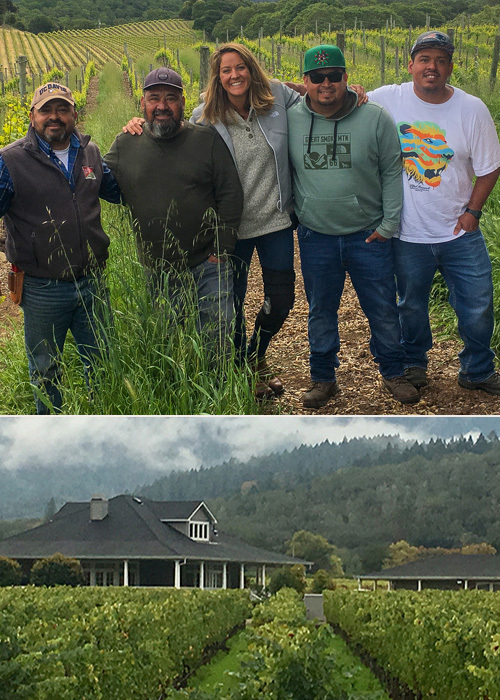 The diversity of soil and clones provides our winemaking team of Aaron Pott and Lindsey Wallingford with a variety of fruit to create three estate Cabernets with distinct aromas, flavors, and textures that reflect our terroir. See clone bud wood from Napa Valley's famed Backus Vineyard is planted on the gravel beds left by the Napa River centuries ago, and yields small, intense berries with strong tannin structure. Clones 337 and 191 are planted nearby to create opulence in the mid-palate of our wines. The See clone is also rooted in the richer soils of our north parcel, yielding fruit with bright acidity and elegant structure. Our vineyard team has been perfecting the art of precision farming for decades and is intimately familiar with every vine on the Saint Helena Winery estate. We truly farm one vine at a time. Sustainable farming practices preserve the health of our land and its inhabitants, and our local environment including bordering waterways. Our estate is Certified Napa Green.